Paulette Tejada, from Le Cordon Bleu school in Miami, was proclaimed the winner in a culinary final where taste, creativity, presentation, aesthetics, orderliness and candour were the criteria for assessment used by the members of the panel of judges in selecting the winning tapa at the first edition of the Cinco Jotas International Tapa Award. 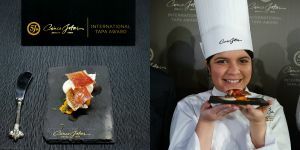 The city of Madrid was witness through the Escuela Superior de Hostelería y Turismo de Madrid of the grand finale of the first edition of the “Cinco Jotas International Tapa Award” on 19 March 2014. 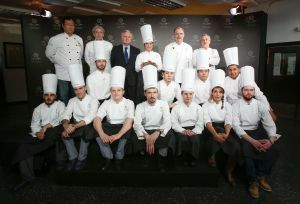 Twelve gastronomic talents from twelve of the best culinary schools in the world competed with effort, talent and the skills learnt to create the Best Tapa using Cinco Jotas 100% Iberian Bellota Ham as the star. 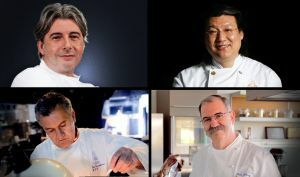 Four prestigious names from the world of international cuisine will be meeting in Madrid on the 19th of March to assess the tapas created by the finalists competing for the Cinco Jotas International Tapa Award. This small format, international haute cuisine competition seeks to create awareness well beyond our borders, about a treasure from our national heritage, ham from 100% acorn-fed Iberian pigs. Students from the twelve best international culinary schools will be competing for this award. Let’s meet the exceptional jury who will decide which creation deserves to be considered the Best Tapa.